Species in the genus Apocephalus are members of the family Phoridae, and members of this family often are referred to as phorid flies, hump-backed flies, or scuttle flies. There are approximately 4,000 species of phorids. They have diverse life histories and include species that are herbivores, fungivores, scavengers, and parasitoids. The most commonly encountered phorids are scavengers. These flies develop in decaying organic matter including vertebrate and invertebrate bodies. A number of phorid flies primarily parasitize ants and some have been introduced into the United States for biological control of the red imported fire ant. Apocephalus borealis Brues (the zombie fly) is a member of a specialized subgenus known as Mesophora. This subgenus parasitizes insects other than ants. Their typical hosts include bumble bees and paper wasps but they are capable of parasitizing many other arthropods. Apocephalus borealis recently has been confirmed to parasitize European honey bees, Apis mellifera sspp. along the West Coast of the United States as well as in South Dakota and Vermont. 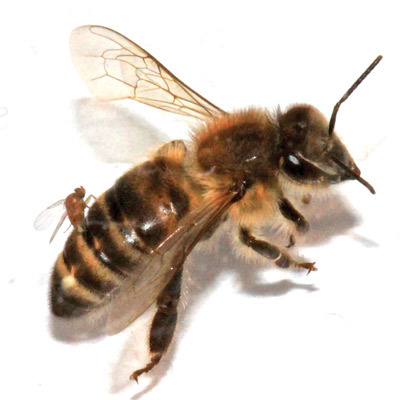 Recently, molecular analyses of honey bees from Belgium tested positive for Apocephalus borealis. These discoveries have stirred interest in both the scientific community and media due to an international interest in honey bee health. The zombie fly has a Nearctic distribution. It has been retrieved from host insects in the western and eastern regions of the United States and Canada (Figure 1). There is a record of Apocephalus borealis in South America. However, some researchers suspect the South American record of Apocephalus borealis may be an error. Figure 1. World map illustrating the locations where Apocephalus borealis has been recorded. Figure by Chase Kimmel, University of Florida, using Esri ArcGIS 10.2: the world physical map layer is from the US National Park Service and the Apocephalus borealis distribution data was accessed through the GBIF Data Portal, 2014-08-19. The zombie fly is a minute phorid fly. Like all flies,the zombie fly is holometabolous and undergoes complete metamorphosis during its life cycle. 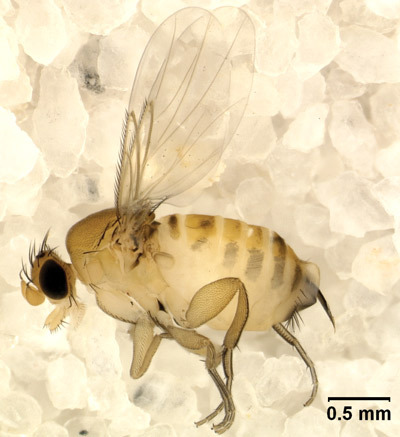 Apocephalus borealis is a parasitoid and spends a significant portion of its life cycle within its host (the female fly injects her egg(s) into the host and most of the larval stages occur within the host). For this reason, detailed physical descriptions of the egg and early larval stages are not available. Larvae: Final instar larvae are approximately 3.3-3.5 mm in length. The body is smooth and pale yellow in color (Figure 2). Figure 2. Two final instar larvae of Apocephalus borealis exiting a honey bee worker at the junction of the head and thorax (the larvae are arrowed). Photograph by John Hafernik from Core et al. (2012). Licensed under Creative Commons Attribution 2.5 via Wikimedia Commons. Pupae: Apocephalus borealis pupae are less than 2mm long on average and brown/amber in color (Figure 3). Figure 3. Four Apocephalus borealis pupae surrounding the dead honey bee from which they emerged. Figure by John Hafernik, San Francisco State University. Adults: To an untrained eye, zombie fly adults may resemble small fruit flies. Adults measure 2.0-2.9 mm in length. The body is pale yellow in color overall with an orange patch on the center of the abdomen (Figure 4). The dorsal aspect of each abdominal segment has increased pigmentation, especially in males. The first abdominal segment has a brown hue and pale posterior margin, the second segment has mid-lateral brown patches, the third and fourth segments have larger dark patches, the fifth segment is entirely brown, and the sixth segment has brown markings at the anterior angles. Apocephalus borealis’ legs are light brown and the female’s ovipositor is brownish-black with a pale tip (Brues 1924, Brown 1993). Figure 4. Adult female Apocephalus borealis. Photograph by Jessica Andrieux from Core et al. (2012). Licensed under Creative Commons Attribution 2.5 via Wikimedia Commons. The head is fairly square with distinctive hairs and bristles that are used for distinguishing Apocephalus borealis from other members of the genus Apocephalus. Antennae are elongated, pear-shaped, and pointed with stout aristae (antennal bristles arising from the third antennal segment; Brues 1924). Wings are translucent and narrow with few veins. The top edge of the wings have very fine fringe consisting of fairly long cilia positioned close together (Figure 5). This extends to about the middle of the wing. Refer to the Brown 1993 publication for a more technical description of Apocephalus borealis, or to distinguish Apocephalus borealis from other members of the genus Apocephalus. Figure 5. Sketch of Apocephalus borealis features in the first specimen description of an adult female: a) lateral (side) view of the female’s ovipositor, b) ventral (underside) view of the female’s ovipositor, c) dorsal (top) view of the right wing. Figure by Brues CT. 1924. Psyche 31(1): 41-44. doi:10.1155/1924/42175 (used with Open Access permission). Extensive research on the mating behavior and overall biology of the zombie fly is lacking. In general, a mated female identifies a host and lays her eggs (oviposits) inside the host. It is unknown whether female Apocephalus borealis use olfactory markers, visual cues, or a combination of both to locate a host. After landing on a host, the female inserts her ovipositor into the host’s abdomen for 2-4 seconds (Figure 6) and lays eggs. The number of eggs deposited by the female into its host remains unknown. The eggs hatch and the larvae feed and develop within the host. Approximately seven days after oviposition, the mature larvae emerge from the attachment between the head and thorax (Figure 2). The number of larvae that emerge can vary significantly; anywhere between 1-13 larvae have been recorded to emerge from an individual host. The emerged larvae then pupate outside of their dead hosts. Pupation typically lasts approximately 28 days, at the end of which adult flies emerge. Figure 6. Adult female Apocephalus borealis ovipositing into the abdomen of a worker honey bee, Apis mellifera. Photograph by Christopher Quock from Core et al. (2012). Licensed under Creative Commons Attribution 2.5 via Wikimedia Commons. The zombie fly is primarily a parasitoid of bumble bees and wasps in North America. Of the bumble bee species parasitized by Apocephalus borealis, Bombus vosnesenskii (Figure 7) and Bombus melanopygus (Fig. 8) are commonly affected in California. 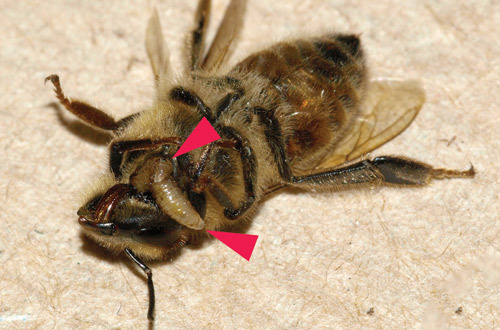 In 2012, Dr. John Hafernik and his colleges at San Francisco State University discovered that Apocephalus borealis also parasitizes honey bees (Figure 9). 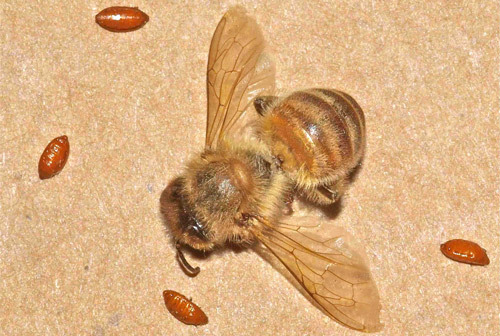 Parasitized honey bees show zombie-like behavior leaving their hives at night and are often attracted to nearby lights where they show disoriented behavior and die in a few hours. A light trap placed near a honey bee hive is an effective way to detect infected bees. Figure 7. Adult yellow-faced bumble bee, Bombus vosnesenskii. Photograph by Kevin Cole from Pacific Coast, USA (en:User:Kevinlcole) - 208-12749. Licensed under Creative Commons Attribution 2.0 via Wikimedia Commons. Figure 8. Adult black-tailed bumble bee, Bombus melanopygus. Photograph by Bob Hammon, Colorado State University, Bugwood.org. Figure 9. Adult worker honey bee, Apis mellifera. Photograph by Lyle J. Buss, University of Florida. 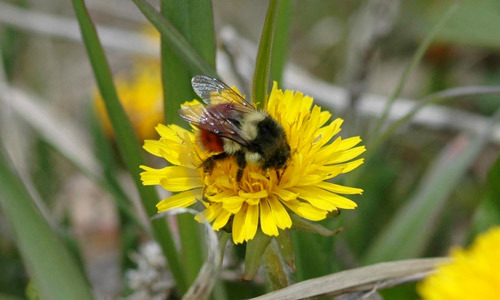 Despite the fact that Apocephalus borealis also parasitizes bumble bees and wasps, much of the current literature focuses on its newly recognized presence in honey bees. 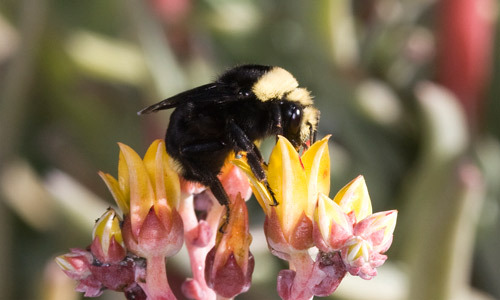 Worldwide pollinator decline is a significant economical concern. Honey bees are leading insect pollinators and the ecosystem services they provides have an annual net worth of $215 billion worldwide. If Apocephalus borealis has demonstrated a shift in host preference, a specific management plan may be required to avoid possible economic impacts. 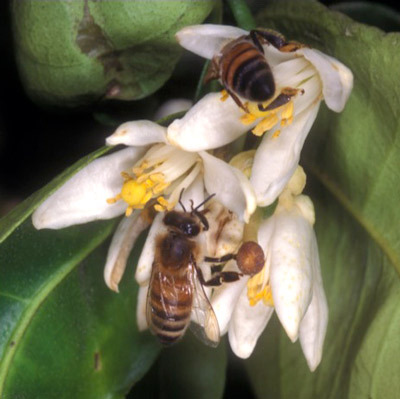 The rate of Apocephalus borealis parasitism is being determined in honey bees. However, this parasitoid could cause an economic loss in the regional honey bee industry. It has been estimated in San Francisco that 77% of the honey bee hives contain workers that have been infected by this parasitoid. The potential economic impact the zombie fly may have on the honey bee industry is worth consideration. This should not overshadow the effects the zombie fly has on other hosts. More information is needed on the effect of Apocephalus borealis on native pollinator populations. The first step to any effective management strategy is monitoring. A Citizen Scientist initiative, entitled ZomBee Watch, was founded by workers at San Francisco State University and the Natural History Museum of Los Angeles. The goal of ZomBee Watch is to identify the zombie fly infecting honey bees throughout the country. This nationwide project uses volunteers from the public to scout, monitor, and report the presence of Apocephalus borealis in their local honey bee populations. 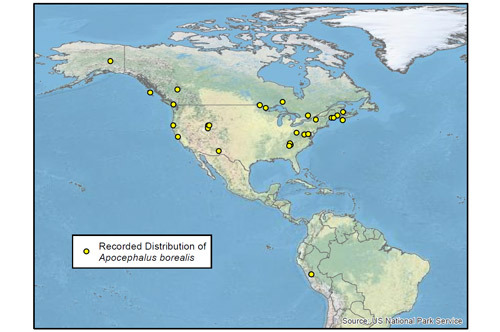 With the help of citizen scientists, regions with large Apocephalus borealis populations, Apocephalus borealis distribution expansions, or host expansions may be detected and documented. Research is ongoing to determine whether effective management strategies exist for Apocephalus borealis. Due to a limited number of collected specimens and lack of wild observations, many details pertaining to Apocephalus borealis’ dispersal, interactions with hosts, and insecticidal susceptibility remain unknown. Further investigation into the chemical cues and behaviors associated the zombie fly and their hosts are necessary. View the 2012 TED Talk featuring Dr. John Hafernik here - Flight of the Living Dead: Dr. John Hafernik at TEDx Jackson Hole. Brown BV. 1993. Taxonomy and preliminary phylogeny of the parasitic genus Apocephalus, subgenus Mesophora (Diptera: Phoridae). Systematic Entomology 18: 191-230. Brues CT. 1924. Notes on Some New England Phoridae (Diptera). Psyche 31: 41-44. doi:10.1155/1924/42175. Core A, Runcke C, Ivers J, Quock C, Siapno T, DeNault S, Brown B, DeRisi J, Smith CD, Hafernik J. 2012. A new threat to honey bees, the parasitic phorid fly Apocephalus borealis. PLoS ONE 7: e29639. doi:10.1371/journal.pone.0029639. Hafernick J. (2012). Flight of the Living Dead. TEDx Talk. (19 August 2013). Ennik F. 1973. Apocephalus borealis Brues parasitic upon Vespula spp. (Diptera: Phoridae, Hymenoptera: Vespidae). Pan-Pacific Entomologist 49: 403-404. Mortensen AN, Schmehl DR, Ellis JD. (2013). Apis mellifera Linnaeus, and subspecies (Insecta: Hymenoptera: Apidae). University of Florida, IFAS, Entomology and Nematology Department, Featured Creatures, EENY-568. (24 September 2014). Otterstatter MC, Whidden TL, Owen RE. 2002. Contrasting frequencies of parasitism and host mortality among phorid and conopid parasitoids of bumble-bees. Ecological Entomology 27: 229-237. Smith K, Loh E, Rostal M, Zambrana-Torrelio C, Mendiola L, Daszak P. 2013. Pathogens, pests, and economics: drivers of honey bee colony declines and losses. EcoHealth 10: 434-445. Publication Date: October 2014. Reviewed: December 2017.